You don't expect a pickup truck to be great to drive, but the segment is changing. 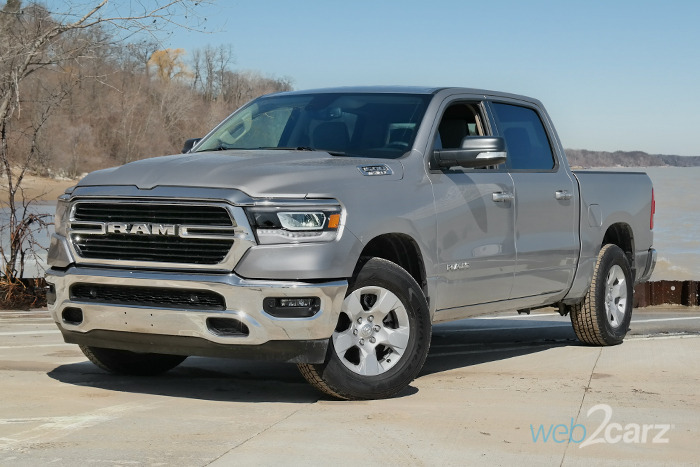 The 2018 Ram 1500 was quite good, but the new one is that much better thanks to serious improvements under the skin. Ride Quality: Excellent ride thanks to an updated suspension and improved, lighter ladder frame chassis. The ride borders on creamy, absorbing bumps very well. 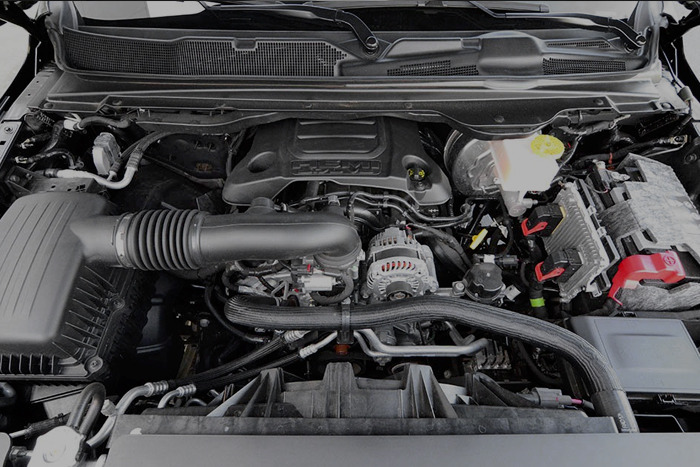 Acceleration: Our optional 5.7-liter HEMI V8 engine was impressively strong. It pulls hard, and the transmission shift smoothly and without hesitation. 0-60 comes in the mid sixes, and that's pretty quick for something this big. Braking: The brakes are strong (thanks to larger front rotors) and progressive, and we love the adjustable pedals. Steering: Steering is surprisingly precise for a pickup truck, but the effort is on the light side. Handling: There's some lean you expect from a tall truck, but thanks to the relocated roll bar, the Ram 1500 manages things very well. You don't have to pony up big bucks to get the Laramie in order to have an excellent infotainment experience. So, the Big Horn doesn't get the enormous 12-inch screen, but the Uconnect system in our tester was simply excellent. 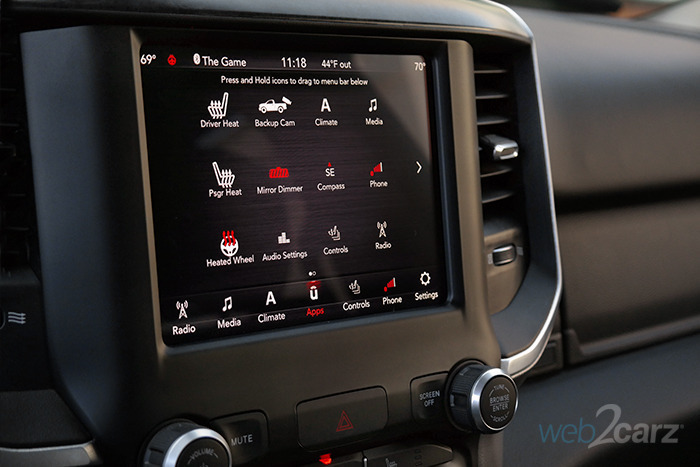 Infotainment System: The optional 8.4-inch screen in our Big Horn was vivid, responsive, and now comes with an indicator that shows when you've pressed a selection. Genius. Controls: The on screen controls work well, but it's the presence of large knobs for audio and climate that make us really happy. Everything works very well. We did have some hiccups with the rotary shifter, but you get used to it. The Big Horn isn't super fancy outside, but the sleeker (but still plenty rugged) exterior makes it seem more upscale than before. Even the basic interior is still quite nice. Front: Ram's new grille gets better the more you look at it. There's a lot of chrome going on, but it still looks good. Rear: There's not a ton you can do with a pickup tailgate, but FCA manages to do it up nicely with some taillight styling, tailgate contours, and two very nice round exhaust tips. Profile: It's well balanced now that the Ram 1500 only comes in crew and quad cab trims. Cabin: There's a lot of gray and black, but they balance each other well. The interior seems far less clunky than GM and Ford offerings, making the Ram Interior one of the best. It's well-styled and even refined for something that's meant to take punishment. You usually expect that biting low rent feel when you don't have leather, but such is not the case with the 1500 in Big Horn trim. The cloth seats look and feel great, and there's just a ton of features inside that are superb for this trim level. Front Seats: Big, wide, and comfortable, the seats are very good for long haul driving, and there's a lot of headroom and legroom. The grey cloth is grippy and high quality. 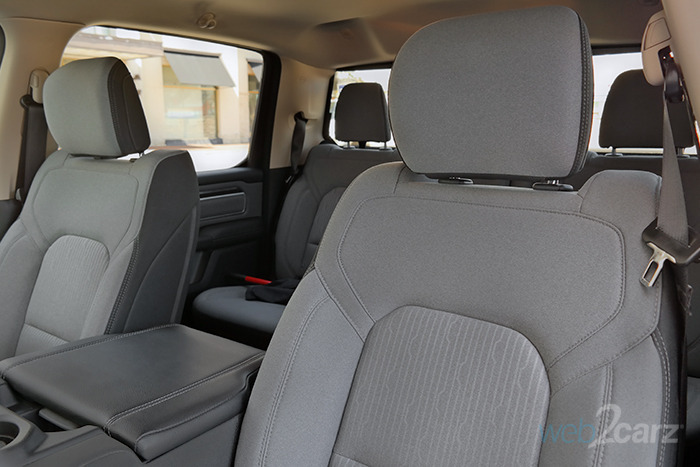 Rear Seats: Though we didn't have the executive seating, the Ram 1500 crew cab has best-in-class legroom, and it shows. This thing is seriously spacious. The rear top part of the LATCH system is hard to use with only fabric loops to secure baby seats to the headrests. 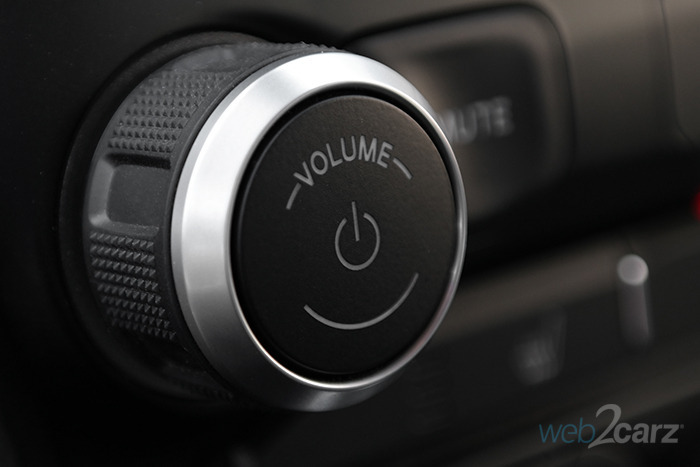 NVH (noise/vibration/harshness): It's rock solid inside with only the guttural growl of the big HEMI engine. Even at highway speeds, it's pretty quiet. Visibility: The truck is tall, so getting around parking lots can be a challenge. The cameras and sensors are a must. Climate: The climate system is easy to use and powerful. We never had an issue getting the heat fired up. The new Ram 1500 hasn't been crash tested yet, but it does have some good standard safety features. 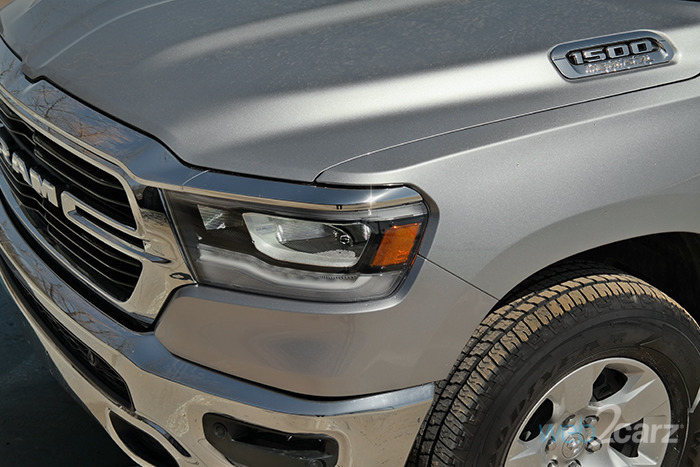 Standard Tech: The Big Horn comes standard with Parkview backup camera, Ready-Alert braking that reduces braking distances in emergency situations, Rain Brake Support, Tire-Fill Alert, and Electronic Roll Mitigation. 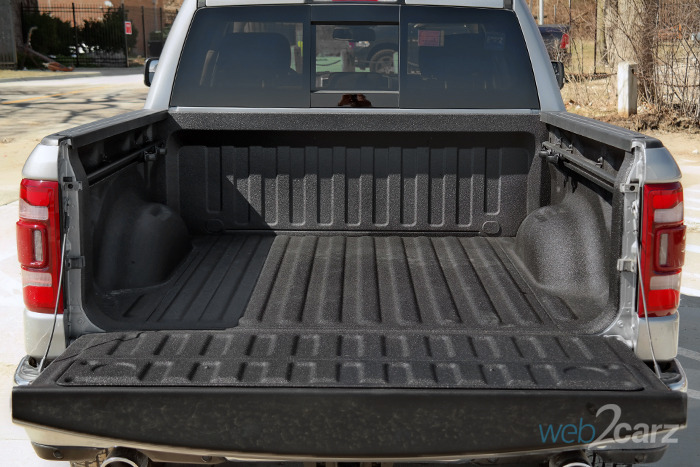 The Ram 1500 is brilliant in terms of storage capability. It's actually one of the best we've seen with ingenius use of internal storage capacity. Storage Space: Not only is the center armrest and cubbies huge, they also fold back to provide a middle seating position in the front row. Our tester did not have the Class Executive Reconfigurable Center Console, but it held our gear incredibly well. The flat load floor in the rear lets you hold a ton of cargo. too. Cargo Room: Cargo volume is 61.5 cubic feet. Ram has worked hard to make its big truck more efficient. It has a 2-degree change in windshield angle, a roof design that helps airflow over the truck bed, an air dam that lowers at speeds above 35 mph with temps above 38 degrees, and new grille shutters. The 2018 model got 13 city / 18 highway / 14 combined, but the new truck improves on that with 15/21/17. That's pretty close to the V8 Ford F-150's 16/22/18. Driving Factors: We spent most of our time on local roads driving with a heavy foot, which accounts for the low gas mileage. The Big Horn's stock audio system works fine. We didn't notice anything particularly great or poor about the sound, and for a pickup truck, it's decent. The sound is clear, and the volume has good range with no hint of distortion. Final Thoughts The Big Horn shows buyers that you don't have to plunk down top dollar to get a great truck. This is the one where you want a balance of technology, power, and reasonable affordability. It drives well, has gobs of room, and feels rather refined inside. Ram didn't go on the cheap with the Big Horn, and that's a very good thing for a pickup truck that didn't crack $50K, even with a host of great options.